This story really touched me. I even cried. A 36-year-old man leaves his home and family in Calcutta to strike out on his own. He travels to London where he earns his way until offered a respectable job at an American university. Before moving to the U.S., arrangements are made for him to marry a woman he does not know. While setting up residence in the U.S. and waiting for his wife's green card to come through, he rents a room from an elderly woman. While the two never really grow close, she makes an impression on him that will last him a lifetime. 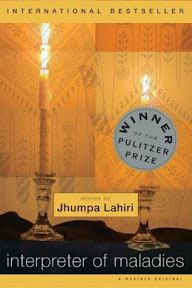 Jhumpa Lahiri has again created characters who are very real and easy to relate to. She captures well the experience of an immigrant, the loneliness and the need for adjustment. I imagine it was the most difficult for Mala, the narrator's wife, who left everything she knew in India to come to the U.S. to be with a husband she barely knew. The author is often very subtle in addressing certain aspects and feelings in the stories that make up Interpreter of Maladies, and yet I always come away with a clear impression of just what that might be. I'm not a big short story reader but this collection sounds like something I might try. I also read your review of The Nobodies Album and appreciate your honesty. At first it sounded like a cool mystery but I'm not sure I'd like the way it's written, either. Sounds kind of confusing! I thought this story was one of the standouts in that collection. I will have to find this book. I loved The Namesake and I am sure I will like this one too. I've got this book of short stories on my TBR list. I soooo need at least two of me so I can read more! This was typical Jhumpa Lahiri - all the characters were so very real! If I recall correctly, this was my favorite story in the whole book. It was the perfect way to bring the book to a close as well.